A potential safety signal with the HPV vaccines in relation to two neurological conditions, Postural Orthostatic Tachycardia Syndrome (POTS) and Complex Regional Pain Syndrome (CRPS), was raised by the Danish Health and Medicines Authority in July 2015, when it asked the European Commission to evaluate the signal. An Article-20 referral procedure was triggered and the European Medicines Agency (EMA) was asked to give an opinion on whether there was evidence of a causal association between HPV vaccines and CRPS and/or POTS. At the conclusion of the referral procedure in November 2015, the EMA opinion was formalised in an Assessment Report, which found no evidence of a causal association between HPV vaccines and CRPS and/or POTS. 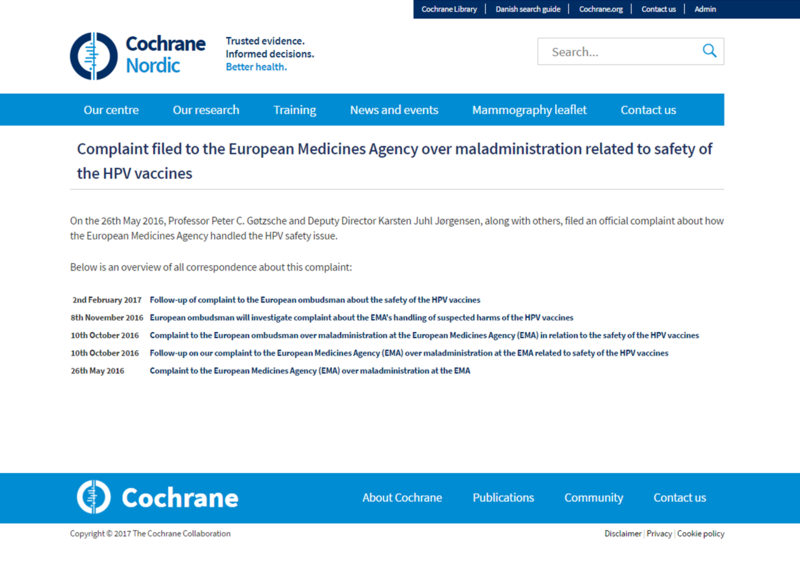 On the 26th May 2016, Professor Peter C. Gøtzsche, Director of the Nordic Cochrane Centre and Karsten Juhl Jørgensen, Deputy Director of the Nordic Cochrane Centre, along with others, filed an official complaint with the EMA about how the Agency had conducted the HPV safety referral procedure. 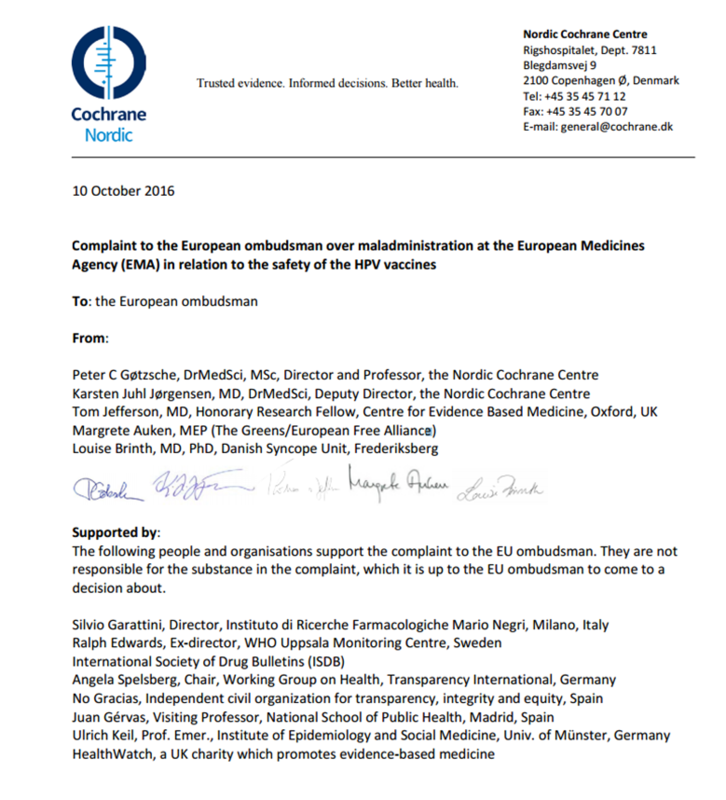 Dissatisfied with the EMA response to their complaint, Professor Gøtzsche and the signatories to the initial complaint to the EMA escalated their complaint to the European Ombudsman, supported by several eminent scientists. The documents from the EMA review and subsquent complaints are listed below, with links to the documents and selected excerpts. “In October 2016, the Ombudsman received a complaint alleging that the European Medicines Agency had not dealt properly with a so-called referral procedure related to a pharmaceutical product and alleging a lack of transparency. The complaint does not concern the safety of the product. After an initial examination of the allegations, the Ombudsman decided to ask EMA for a meeting. A meeting between EMA and Ombudsman staff took place on Wednesday, 7 December 2016. The steps the Ombudsman has taken in response to the complaint solely concern administrative and procedural issues. To that end, the Ombudsman is looking into whether EMA has procedures in place that ensure that all the relevant evidence is available to its scientific committees and whether EMA has been sufficiently transparent about how its committees reach their scientific conclusions. The Ombudsman’s staff have not identified any deficiencies to date. This case concerned how the European Medicines Agency (EMA) carried out a “referral procedure”, which is a procedure to deal with questions relating to medicines already on the market in the EU. The specific referral procedure related to human papillomavirus (HPV) vaccines. HPV vaccines prevent infections with the most common types of HPV, which can cause cervical cancer. The procedure was conducted by the Pharmacovigilance Risk Assessment Committee (PRAC), which is EMA’s committee responsible for monitoring the safety of medicines on the market. The aim of the procedure was to examine whether there is any evidence of a causal link between HPV vaccination and two syndromes, complex regional pain syndrome (CRPS), a chronic pain condition affecting the limbs, and postural orthostatic tachycardia syndrome (POTS), a condition where the heart rate increases after sitting or standing up, causing symptoms such as dizziness and fainting. PRAC concluded that the evidence did not support a finding that HPV vaccines cause CRPS or POTS. This finding was later confirmed by EMA’s Committee for Medicinal Products for Human Use. The finding is shared by other public health bodies around the world. The complainants expressed concerns about the handling of the referral procedure, its transparency and openness, and its impartiality. They mainly disagreed with the nature of PRAC’s scientific work. The European Ombudsman’s Office is not a scientific body. The Ombudsman’s role does not include taking a view on the merits of scientific evaluations carried out by specialised scientific agencies, such as EMA’s assessment of the safety of a medicine. The Ombudsman may, however, seek to assess whether scientific bodies such as EMA have the necessary procedural safeguards in place to ensure that the examination of scientific evidence is complete and independent, and whether these safeguards have been properly applied in any given procedure. Following her inquiry into the procedural aspects complained about, the Ombudsman concludes that her inquiry did not identify any procedural issues that could have negatively affected the work and conclusions of PRAC in the referral procedure. The examination of the scientific evidence was complete and it was independent. Given the importance of ensuring citizens’ trust in the procedures of bodies such as EMA, the Ombudsman suggests that EMA proactively makes public as much information as possible on the scientific work of its committees. In response to a suggestion made by the Ombudsman during her inquiry, EMA agreed to review the confidentiality requirements on experts so that experts may discuss in public details of the scientific debate once that debate has been completed. The Ombudsman also suggests that EMA provides more information on the documents of relevance it has in its possession, so that it is easier for citizens to request access to such documents. Finally, the Ombudsman considers that EMA’s conflict of interest policy was fully complied with during the referral procedure on HPV vaccines. There were no identified conflicts of interest. The procedure in question was therefore deemed to have been conducted in full independence by the relevant scientific experts. The Ombudsman concludes that there was no maladministration by EMA in the handling of the referral procedure on HPV vaccines. “The Ombudsman made a decision in our case on 16 October 2017. We provide here a comment on this decision in the same order as in the Ombudsman’s letter to us. We started the case on the 26th May 2016 by submitting a complaint to the European Medicines Agency (EMA) over the EMA. The documents in the case are available at here. 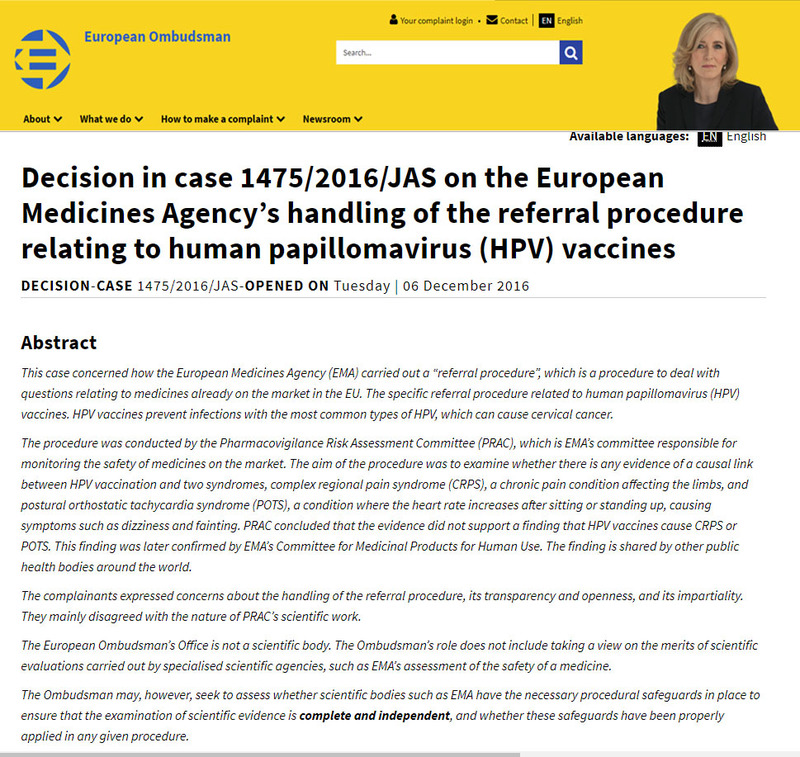 “The Ombudsman concludes that there was no maladministration by the EMA in the handling of the referral procedure on HPV vaccines. We disagree. We found many examples of scientific maladministration. As long as the Ombudsman is not willing to comment on scientific maladministration, even when it is apparent for people without a scientific background, there is, in reality, no public safeguard against poor conduct by EMA. As far as we know, there is no disciplinary committee in the European Union that can take appropriate action against EMA. We find this deeply concerning. 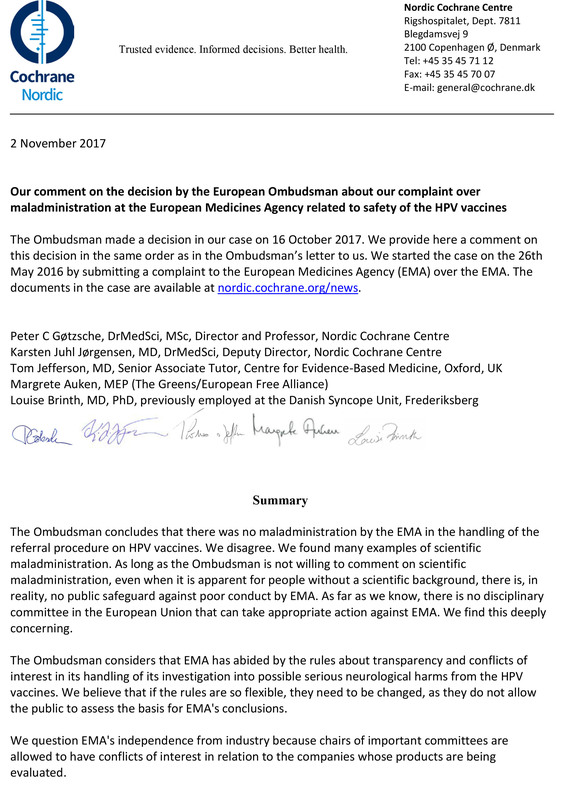 The Ombudsman considers that EMA has abided by the rules about transparency and conflicts of interest in its handling of its investigation into possible serious neurological harms from the HPV vaccines. We believe that if the rules are so flexible, they need to be changed, as they do not allow the public to assess the basis for EMA’s conclusions. We question EMA’s independence from industry because chairs of important committees are allowed to have conflicts of interest in relation to the companies whose products are being evaluated. We acknowledge and welcome the Ombudsman’s recommendation of greater openness and more user-friendliness for researchers and others who wish to get access to EMA’s documents. The Ombudsman recommends that experts who participate in EMA’s assessments should be allowed to participate freely in the public debate. We hope that these recommendations will be the rule and not just friendly calls to EMA. The main part of our complaint is about the substandard way that EMA evaluates science. This has huge consequences for public health. We acknowledge that it is not the Ombudsman’s task to take a view on the science. 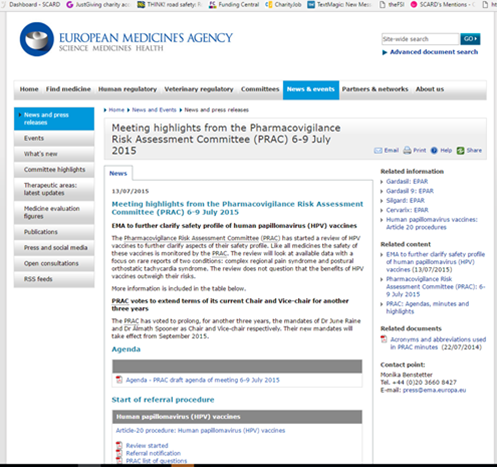 However, we note that the Ombudsman on many occasions has chosen to trust EMA’s scientific assessments, which are based on the data the drug companies gave them, even though EMA knew that the companies could not be trusted. The Ombudsman does not challenge that the assessment of a possible relation between a drug or a vaccine and serious harms is provided by the marketing authorisation holders without independent re-analysis of the underlying raw data and scrutiny of the methods used to reach the conclusions. 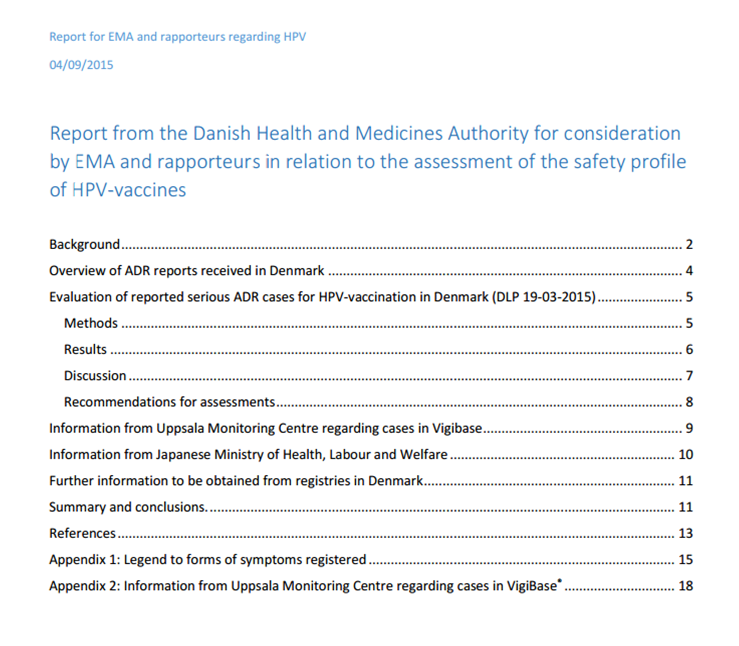 The evidence is, however, that drug companies often underreport even lethal harms for the authorities, and it has been documented, both to EMA and to the Ombudsman, that Sanofi Pasteur MSD, one of the HPV vaccine manufacturers, on two occasions, both in Sweden and Denmark, had seriously underreported neurological harms associated with its HPV vaccine to the authorities. The Ombudsman does not believe that pooling heterogenous active substances (misreported as “placebos”) is scientific misconduct. It also appears to be acceptable to dismiss the results of independent researchers and the Uppsala WHO Monitoring Centre, which found signals that suggested neurological harms. 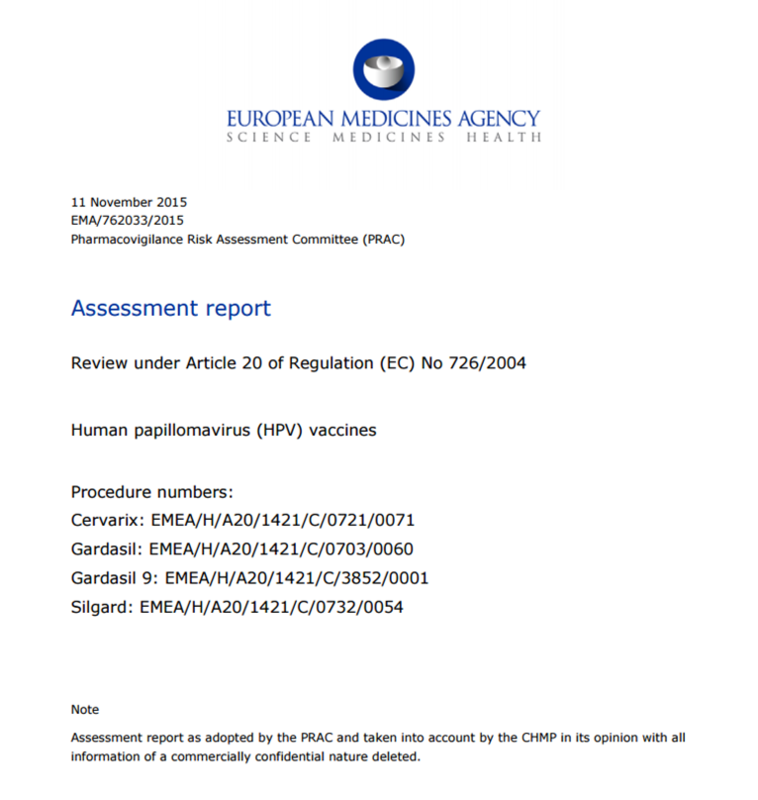 Furthermore, the EMA has not been reprimanded for the excruciating slowness with which it releases clinical study reports of the HPV vaccines, and with its unnecessary redactions that make any independent re-analysis very difficult. 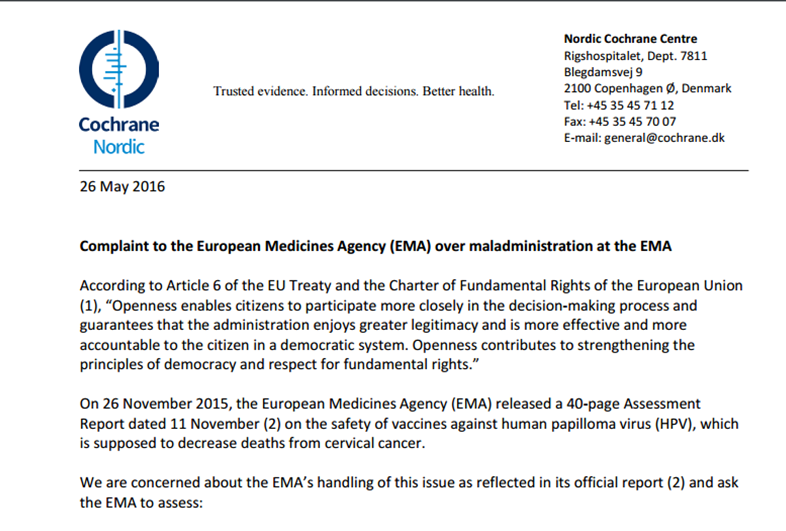 “EMA has not respected the citizens’ rights to know about the scientific uncertainties related to the possible harms of the HPV vaccines, as envisaged in Article 6 of the EU Treaty and the Charter of Fundamental Rights of the European Union. Furthermore, EMA has not lived up to the scientific standards that must be expected of the agency. Finally, EMA withheld important information from its expert committee, namely the results of EMA’s own literature searches and EMA’s interpretation of what it found. “In the assessment report written and published by EMA, three of my publication regarding my clinical experience with patients with suspected side effects to the HPV vaccine are directly criticised. Furthermore, my clinical expertise and judgement are indirectly criticised as a substantial part of our adverse effect reports (AER) are overruled. I want to defend my work but most of all I want to join in and encourage to an open and honest debate. My agenda is not to miscredit the vaccine, rather it is to maintain public confidence in the vaccine itself and the entire childhood vaccine program. The reach this goal, I believe that it is imperative to appreciate that vaccines can have side effects and it is the responsibility of the health care community to monitor and investigate serious problems which are suspected to be related to the vaccines. “I have no doubt that the vaccine works in the way, that it stops/inhibits the development of the premalignant changes and that this, together with the national screening progams, may reduce morbidity and mortality in a vaccinated population. The additional effects of reducing the frequency of genital warts in women and men is also acknowledged.